New York - An Israeli invention, launched on Tuesday, has set out to put quality back in family time by taking smartphones out of the equation. The device, called Pause, is a sleek designed box that blocks Wi-Fi, incoming calls, text messages or emails from cellphones placed inside of it. Using the “out of sight, out of mind” principle, it strives to “remove the temptation of peeking at email or social media when focus is needed elsewhere,” the company said. Pause co-founder Yuval Lazi explained he got the idea about 18 months ago, sitting at the dinner table with his family. Within seconds, Lazi found himself completely immersed and focused on the screen of his smartphone. When he finally lifted his head up, he realized his threeyear- old son Liam had been trying to get his attention repeatedly for over a minute. According the 2014 State of the Kid report released by the company Highlights, which makes educational products for children, Lazi’s son is not alone. The report shows 62% of kids feel like their parents are distracted or focused on other things when they’re trying to talk to them, the main culprit being cell phones. Knowing the problem extended to more than just his dinner table, Lazi then decided to partner with childhood friends and create Pause. According to him, the main purpose of the device is to serve as a constant reminder for people to put their phones aside. He pointed out that Pause can also be used in a workplace setting. The 2015 Lireo Workplace Culture and Communication report shows indeed that 47% of workers say that their biggest issue during meetings is that other participants aren’t paying attention. 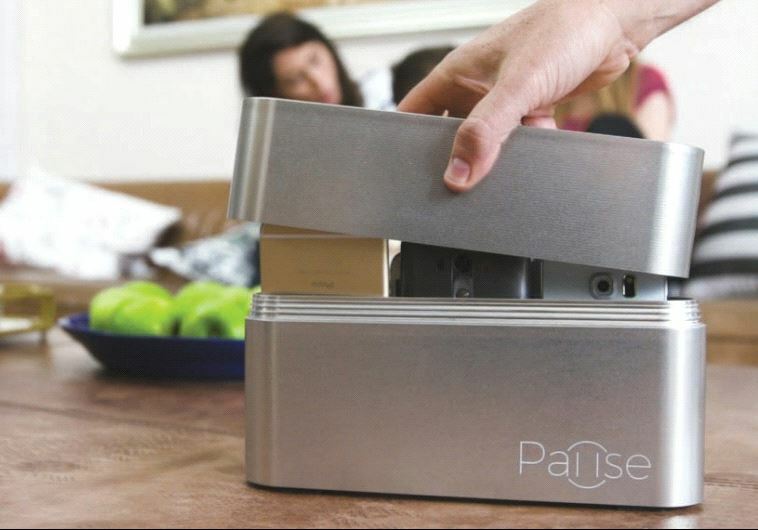 The Pause box started selling on Tuesday on the crowdfunding website Indiegogo. It retails for $40. How's about using self control and save $40? We Yidden are all about self control, aren't we? So just carry it over to that rectangle full of radiation and enjoy your family and real life! We have "Pause" every shabbos and Yom Tov. We eat together, sing, reminisce, talk, play games.... This is more of a gadget for people who never experience the quality of life family time that we are blessed with EVERY SINGLE SHABBOS! You gave yourself a kinne hora. So the rest of the week there is no need for family time? no need to spend undivided attention on your kids or spouse? For those that are shomer shabbos, great, but that doesnt negate the fact that there is still 6 days that phones are permitted and are a distraction for quality family time. Many people have self control (or dont get constant texts, emails, whatsapps, etc) which is great for family time or a meeting, but there inevitably will be the other people (your kids!) who are attached and constantly check their phone for every notification. This is a great invention and hopefully enough people will use their logic and purchase this, rather than rely on their heart which says they dont need it. I think a great addition to this would be a timer lock so there is no temptation to open it and check your phone in the middle of the meal! ya sure you are a dreamer otherwise how would you account for people that are shomer shabbos and smoke during the week but not shabbos. We use a breadbasket and all the phones go in there before we sit down to a meal. Simple solution: Smash your phones like Hillary did. HOw stupid. For people who aren't addicted,they can put those phones away and not look at it while you're with your kids. Don't even get me started on all the addicted people I see in the streets looking at their phones while wheeling baby carriages or crossing the street!!! Get normal!